Keeping track of McClatchy's low-valued stock. Keeping track of the house Cheryl Dell purchased in July for $1.2 million. Click the "e-mail" above to read what I sent to the Bee to inform them they had failed to list a home sale to their new publisher in their database. Click on the "Breaking News" flash and see where the Bee includes a home sale in their newspaper on Oct. 5. The Bee wants to provide information to their readers with a database showing state worker's salaries, yet the Bee appears to be keeping information about a recent home sale to their new publisher hidden from their readers'---in their home sales database. 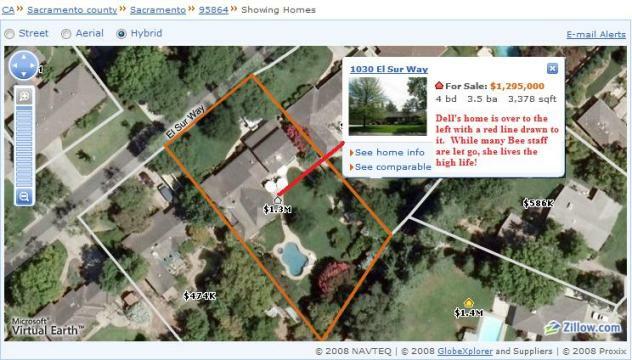 On July 25, 2007, Cheryl Dell and her husband Brad, purchased a home located at 1030 El Sur Way, Sacramento, CA 95864. The public information from the Sacramento County Assessor's office show that Dell and her husband are the owner's of this home. 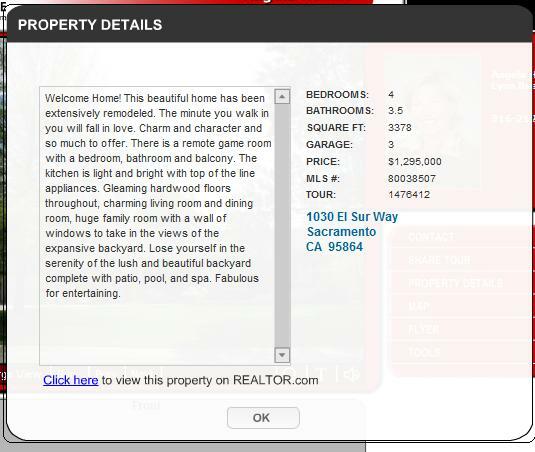 The Bee's home sale database does not show the sale of this home to the Dell's. Just because there is a notice claiming "information powered by On Board LLC" on the Bee's site doesn't mean that information can't be manipulated in the Sacramento area by those who have the power to do whatever they want. Wouldn't you think a house for sale, with a vitual tour, along with a MLS# and selling in the zip code 95864 would have shown up in the database? Below is a recent snapshot of Zillow.com now showing the July 25 sale of 1030 El Sur Way. The (Lyon) agent involved in listing this property still had this property on their site with a MLS#. 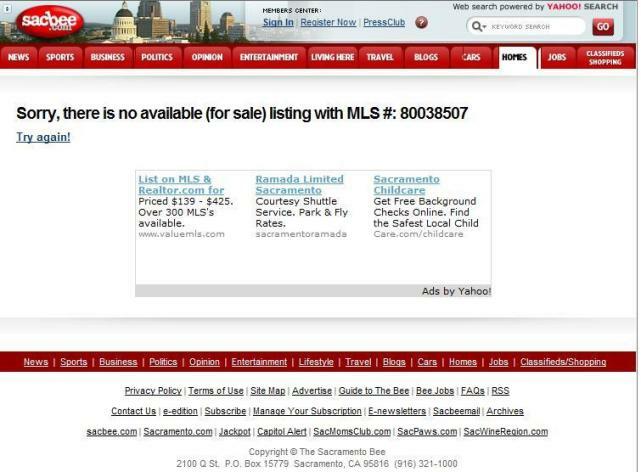 When typing that MLS # into the Bee's database it came back with no listing for that number. 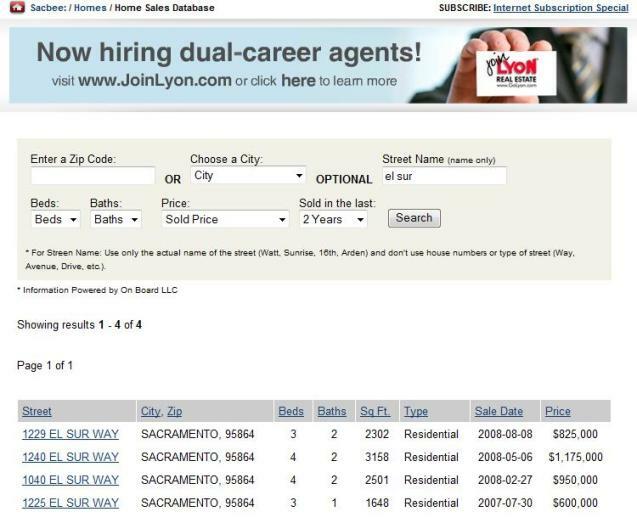 Why does this particular home sale fail to show up in the Bee's database? According to one real estate agent, this particular property sold on July 25, 2008 for $1,200,000. It was listed for $1,295,000. How much money is the Bee paying Dell as their new publisher? Probably a lot for a person to live a lifestyle such as this and this might explain why lots of other Bee staff are getting the boot with buyouts because they can't afford these employee's any longer. I guess it would be hard for Dell to announce buying a $1.2 million home while planning on giving pink slips to many hard working Bee employee's. Was this home sale to Dell intentionally left out of the Bee's database by somebody at the Bee? I don't know. If not, then the Bee needs to add this home sale to their database. Also, I find it interesting that the real estate agent involved in this property is a Lyon representative, and Lyon can also be seen above as an advertiser to the Bee. Some strange things are going on at the Bee. Below is an aerial view of this home. This is starting to look like typical Bee nonsense.